Shortly after arriving in the Bahamas we’d heard about the 5F festival on Little Farmers Cay. First Friday in February Farmers Festival. A number of people said, if you can get there, it is well worth it. We were told people come from all over the Bahamas to this annual weekend festival and we wanted to be one of them. 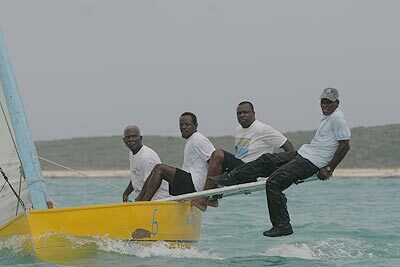 We arrived in Little Farmers Cay late Friday afternoon, just in time to see a sailboat race finish. Little Farmers is a small “out island community” with a population of about 40 people. But for this weekend, the population grows to 150 – 200. After talking with a local fellow, Tyrone and his sister who were cookin’ up ribs, pea soup and conch salad at their food stall, we found out that the local school has 8 students and one teacher. It reminded Kim of the small communities in Newfoundland. Everybody knows everybody else and in most cases people have more than one job in the community. For example “Little Jeff” drives the taxi, does fishing tours, owns some moorings, runs a General Store and I am sure anything else you might want him to do. It felt like the island was having a Homecoming. Part of this Annual festival includes traditional sail boat racing. The small wooden boats carry very large cotton gaff-rigged sails, something that was used long ago. Now-a-days sailboats carry sails made of dacron and other synthetic materials. What also makes these boats unique is that they have wooden boards or planks that slide from one side to the other and the crew then sit on them to keep the boat upright. Having raced different sized sailboats since I was 13 years old, this looked very exciting. We had to check it out. First thing in the morning, we moved Amanzi around to the inner harbour of the Cay in preparation for another Cold Front that was due to arrive later in the evening. Having settled in and made sure that all the anchors we well set, we went off to view the racing. Arriving at the race course shortly after the start, we found 8 boats dueling it out in a good steady 15 knot wind. In our dinghy, Kim and I zoomed around behind and in front of the racing boats taking photographs. There were other chase boats, large and small, with both coaches and spectators and envious racers/sailors like us. After the first race ended, everyone headed into shore to the beach for lunch and refreshments. Along side the beach was a small runway strip with small airplanes taking off and landing over the water. It was amazing. A D.J. was inside one of the huts with reggae music playing to add to the festive atmosphere. Inside the hut was a refreshment counter and the smell of jerk chicken on a flaming grill next to the hut drew in the crowds. Relaxing on the sand, was when the best surprise of our trip so far happened. As I was sitting on the sand chatting with a friend, a gentleman in an orange T-shirt and cap came along and tapped me on the shoulder. His name was Dr McVie and he happened to be the owner of Thunderbird, one of the racing boats. He was short of crew and asked me if I wanted to go racing! It was like a dream come true -me racing on a traditional C-Class boat. I couldn’t believe it. There were plenty of people on the beach but he just happened to walk up to me. What good luck! Standing up and nodding my head, I shook his hand and was thrilled to seize this chance. I hurried over with Dr. McVie and a buddy to the support boat, which was taking us out to his race boat. Kim quickly saw what was happening and was invited to come along in the support boat to take pictures. Out on the water, I scrambled aboard the boat,Thunderbird and met the rest of her crew. Jim, Mossy and Kevin were the experienced Bahamians, and a fellow cruiser from Montreal, Patrice, and myself completed the crew. We were a motley crew, but we were pumped. As I climbed aboard Thunderbird, the first thing I noticed was that these Bahamian C-Class racing sloops ( a style of boat) are not the fancy fiberclass racing machines you see in Canada, the United States and elsewhere. Instead, these brightly painted boats have a very simple design. 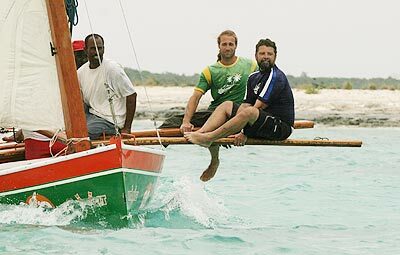 They are hand-made wooden sloops with a wooden mast and boom. What makes these boats unique is that the boom is more than twice the length of the boat itself. So, they carry lots more sail than racing boats we see today. With this much sail, the boats need to have two planks, attached to the boat, that can slide from one side to the other. This way, the crew can safely hang out over the water and keep the boat upright. No need for special safety harnesses or expensive gadgets. Just a simple piece or wood to hold onto. One other feature to keep the boat upright are the loose lead ingots or lead bars that are placed in the bilge to add ballast or weight. 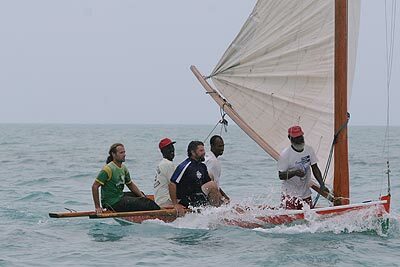 This combination of sail, boom length, planks and lead weight make these boats special Bahamian Racing Sloops. The Support boat, with Kim and a number of other spectators on board, towedThunderbird and her crew to the starting line, with a few jeers and shouts from the other boats, as we approached them, jostling for position. The starting line has each race boat lined up with an anchor overboard and the sail down. This is very different from club races I’m used to. The races I’m used to has boats moving up to the start line and jostling for position with all sails flying. It is equally tricky. So one more feature that was new and exciting. Before the race starts, each boat is secretly pulling in their anchor line, being sure not to be too obvious, yet keeping their eye on their opponents. And as soon as the whistle sounds, the anchor comes in and the sails are hoisted. It is chaos with shouts and boats going everywhere. As we turned to avoid a collision with another race boat, the boat heeled and Patrice and I scrambled onto the sliding planks obeying the orders from the captain On the Plank! On the Plank! We clung on to make sure we didn’t fall off. WOW! This is one fast introduction to Bahamian racing. The 2 favoured boats from yesterdays races slowly pulled away from the fleet doing their own battles. However, Thunderbird found that she was well matched with It’s Magic, a sloop from Black Point (a small community just 10 nm north). As we dueled it out and crossed paths numerous times, both boats took turns with the lead. At one point, It’s Magic was slow to respond to our calls of Starboard, which means give us the right of way, and we collided. Thankfully, no one was hurt and we all continued racing amid shouts and laughter. The highlight of our match race with It’s Magic was at the top windward turning buoy. We caught up with our challenger and managed to tack underneath her getting to the buoy first. A sweet victory! It doesn’t matter where you are in the world, there is a sense of comraderie that comes from teamwork when racing. Win or lose, it’s a wonderful thrill. In the end,It’s Magicgot away on us and finished the race ahead of us. But it didn’t matter, because there’s always next time.